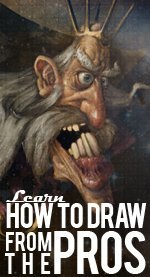 This facial proportions video is the third in the learn how to draw faces free video course. Today, you will look at real life example photos and apply the simple proportion guidelines that you learned in the previous two lessons to see how the guide works when you want to draw realistic faces. You will quickly find that though the guide gives you a good place to start from, it doesn't work perfectly for all face shapes. As you start to examine the human head more closely what you will notice is that each face has its own unique characteristics that make it different from every other face. The world would be a pretty boring place if we all looked exactly the same wouldn't it? To get the downloadable lesson and examples as well as all the updates for the course make sure to sign up just underneath the video if you haven't done so yet. This way you're sure to get everything you need to start drawing better faces immediately delivered right to your email. Now, let's get into the lesson! Signup to get the Full How to Draw Faces Course and Worksheets! If you like what you see from this facial proportions video drawing lesson and want to get more lessons about learning how to draw faces to sign up with your name and e-mail address below. Now that you're familiar with the guide start to use that knowledge that you now have about proportionsof the face and start looking at the people around you in everyday life and how their heads differ from the guide. It's easiest if you concentrate on the main features of the face as well as the general shape of the face. This includes the eyes, nose, mouth, eyebrows, hair and jaw line. One of the things that I personally noticed was how flat the back of some people's heads are. The guide that we have been using doesn't account for people with flat heads, and this is just one example of the many that you're sure to find now that you have a good grasp of how to construct a face with basic proportions in mind. The next lesson will examine shading your human head drawing. If you've done the homework as well as a little bit extra practice in your sketchbook you should start getting comfortable with drawing the head from many different angles. Don't worry if your drawings aren't looking perfect, as the goal here is to understand the facial proportions and be able to create a set of guides that you can use to follow to draw a face. Perfection will come with time, so if you can now draw the face from the front, side and three-quarter view you really should congratulate yourself  youre ready for the next step!